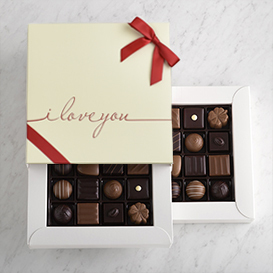 Stacked with four full tiers of shareable chocolates and finished with our I Love You Gift Toppers, this gift says, 'I love you' inside and out. 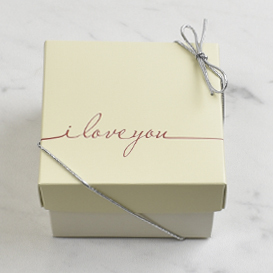 Bottom Tier: A Two Layer Deluxe Collection Box, a shareable variety box including two identical layers of our 16 best sellers capped with a lovely I Love You Gift Topper. 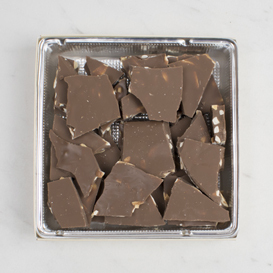 Second Tier: A half-pound box of Milk Chocolate Almond Bark, freshly toasted vanilla-sugar almonds blended with our smooth Swiss milk chocolate. 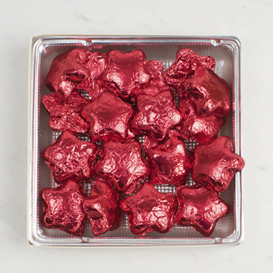 Third Tier: A half-pound box of creamy Milk Chocolate Stars, individually wrapped in bright, shimmering red foil. 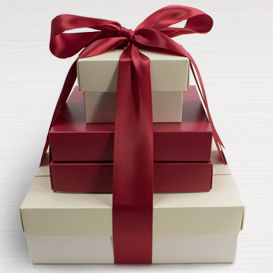 Top Tier: A special Eight Piece box filled with our a variety of our most popular flavors, finished with an I Love You Gift Topper.